TOBACCOVILLE, NC - As I sit here at my desk and look out over my backyard, the signs of Spring are everywhere. The gregarious grackles are feeding on the ground, robins are calling and grabbing for a plump worm, and the northern cardinal has begun to sing at length. Although these birds are are all amazing creatures, the focus of my lens this year will fall on the amazing and beautiful eastern bluebird. A member of the thrush family, the eastern bluebird is a striking figure with it's bright blue feathers and rusty breast. One might argue that they are more striking than the famed northern cardinal. Although, I certainly knew about and admired the eastern bluebird in books and magazines, it wasn't until 2014 that I came almost face to beak with this amazing little bird. It was winter of 2014 to be precise. A cold snap had fallen on the Piedmont of North Carolina, and to prove it we had several inches of snow on the ground that morning. Knowing that birds would be desperate for food, I put fresh seed in the feeder, climbed into my blind, and began waiting for the birds to wake up and start foraging for food. The typical suspects were present. Carolina chickadees, wrens, nuthatches and the titmouse all made the list that day. This day, I was performing what is called short lens bird photography. This involves using a lens in the 200-300mm range and setting up a perch about 8 feet away from the camera. Using this technique you can get a more intimate look at the subject and often a different perspective. I had pre-focused on the perch, and with shutter release in hand I made many photographs of the typical subjects. This went on for probably an hour, but eventually a lull settled in as the birds retreated back to safer locations. I was almost ready to call it day when, without warning, there on the perch was a male eastern bluebird. Instinctively I brought my thumb down on the remote release and the camera fired a burst of five images. Although these first images were nothing to brag about, that day began a great interest in the bluebird. 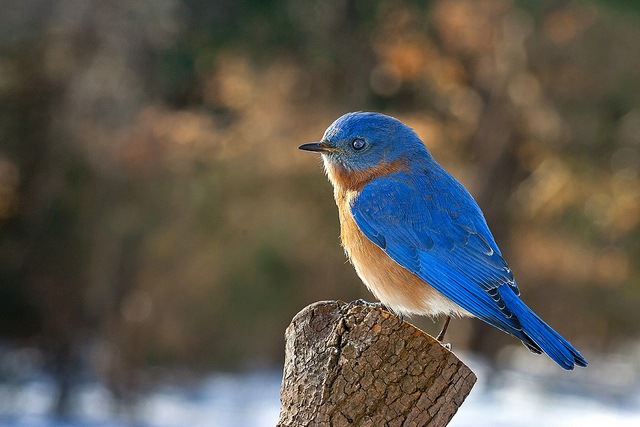 In 2017, I continue my pursuit of study of the eastern bluebird, by officially launching "The Bluebird Project." 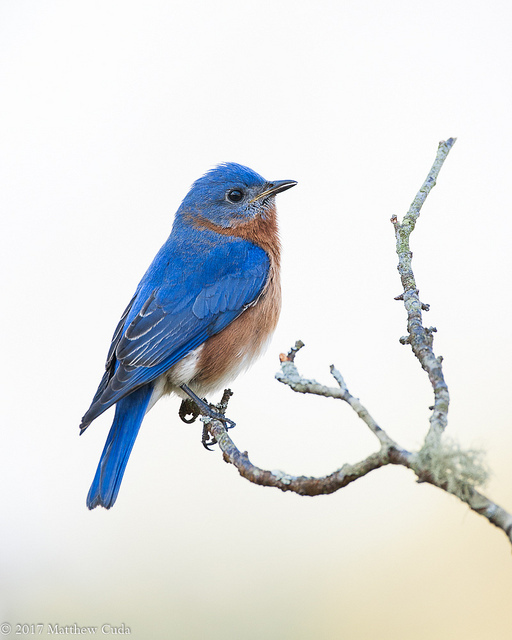 This will be an ongoing project where I photograph the life of the eastern bluebird. I have had the privilege of watching brood after brood emerge from nesting locations and now I officially begin the documentation process. Below are the first images to christen this project in 2017. Forsyth County, NC - A high key shot of the male eastern bluebird calling. Note the head tilted back slightly and the feathers raised. This is a typical behavior when a songbird is calling or singing. He is currently part of a nesting pair I am documenting with this project. 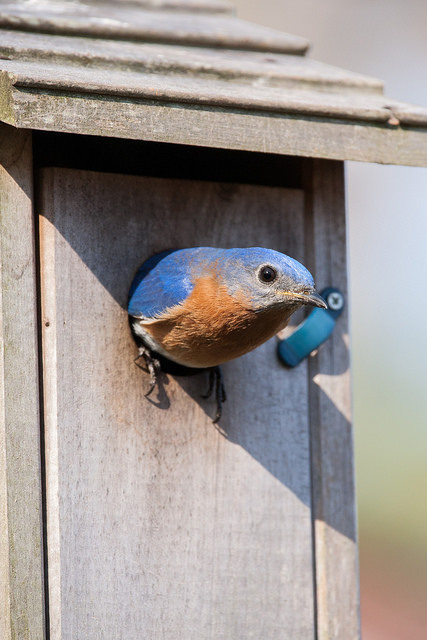 Forsyth County, NC - Part of The Bluebird Project, involves documenting their nesting behavior. Here the male darts out from the nest box. Forsyth County, NC - The image that started it all. Perhaps not my best work, but sometimes it only takes one shot to start a new passion. I hope you enjoyed this month's images. It is always my hope that others will be able to experience what I see though my eyes as I travel God's great and magnificent creation. He is the great painter. All I do is just share his paintings. Copyright © 2016 Matt Cuda, All rights reserved.